One use-case for cloning a repository is so that you can work on the same files from multiple different computers. Another, and indeed defining use-case of Git, is so that multiple different people can clone a single repository, and all make contributions to it together. Other people can only push changes to your cloud repository if you give them permission. You can give other GitHub users permission to push to your cloud repository by editing the “Settings” of your repository. Click on the “Settings” link (normally on the right), and then navigate to “Collaborators”. GitHub provides a search box to find people, based either on their email address or GitHub username. Find the person you want to add, and then click “Add collaborator”. A major problem of allowing multiple people to share and contribute to a single repository is that it increases the probability of conflict. Conflict occurs when two people are trying to make different changes to the same line of a file. We are going to simulate a conflict by making conflicting changes to our “original” and “cloned” versioned_dir repositories. Commit this change and then push it to the cloud. Ensure that you use an informative commit message. Git has seen that the changes to the local repository conflict with the changes in the cloud repository. Git reports this in the CONFLICT line, with Git reporting that the conflict is in README.MD. Where possible, Git will try to resolve conflicts automatically, by merging changes where possible. However, if the changes occur on the same line, then automatic conflict resolution is not possible, and you will need to fix the conflict manually. The line that has a conflict is written twice. The first is the version of the line in HEAD. The second is the version of the line on the cloud repository, with the specfied Git commit ID. Once you have fixed the conflict, you need to tell Git that you have manually merged the files. You do this by using git add to re-add the file back to the repository, e.g. You should see that Git recognises that you have fixed the conflict, and is happy for you to commit the change. Make sure that your commit message contains some information about how you fixed and conflict, and why you merged in the way you did, e.g. Now, run git pull again to make sure that nothing else has changed while we were fixing the conflict. Now everything is ok, you can git push the merge up to the cloud repository. Finally, change back into your “original” versioned_dir, and use git pull to check that you can pull in the new, merged, README.MD, e.g. git status to ensure your working directory is clean. If it isn’t, then clean it up and git commit -a any changes. git pull the latest changes from other people. If there are any conflicts, then merge them now, then git commit -a and git push the merges to the cloud. Make changes to your files as you want. git commit -a your changes, and use git status to then ensure that your working directory is clean. git pull to pull in any changes that anyone else has made while you were working. If there are any conflicts, then resolve those conflicts and git commit -a until your working directory is clean. When git pull causes no changes and git status shows your working directory is clean, then use git push to push your work to the cloud repository. 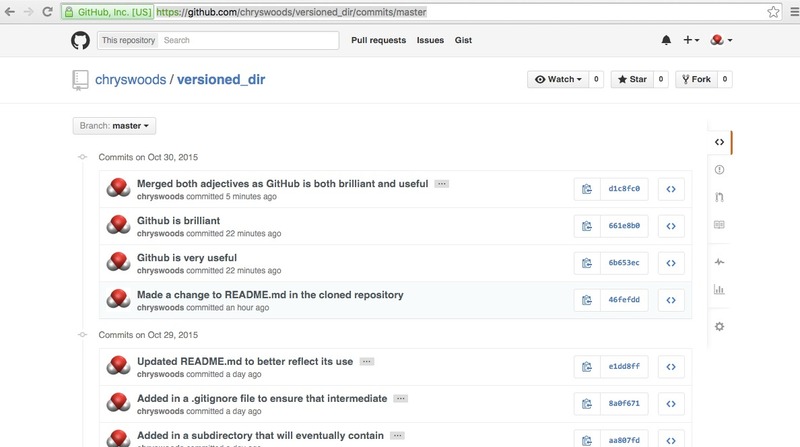 Make some conflicting changes in your “original” and “cloned” copies of versioned_dir. Try to commit and push both to the cloud. What happens? Use git pull and then resolve the conflict. Once you have resolved, use git add to signal that the conflicted file has been resolved, and then git commit -a and git push the merged file back up to the cloud.